A.J. Liebling once said: that the ‘freedom of the press belongs to those who own one.’ So it’s a good thing we do. To celebrate and mark the 25th anniversary of Lumpen Magazine, fellow arts and culture supporters Gabriel Magliaro and Matt Gallagher, of Half Acre beer collaborated with Lead Brewer Tim Lange and Lumpen publisher, Ed Marszewski of Marz Community Brewing, to brew an Imperial Red Lager, with an ABV of 7.5%. In poking fun at the left wing publication, Magliaro suggested that. “It could be fun to bend the name of the beer around the idea of a giant, all encompassing organization that aims to pull the life from anything pure and successful.” and suggested the name of the beer Omnolith. It was unanimously endorsed by all. This is the second time Half Acre has made a commemorative beer for Lumpen . On it’s 20th anniversary in 2011, Half Acre brewed the Imperial Red Ale called The Chairman and that experience probably foolishly inspired the Lumpens to get into brewing. To bring the collaboration to another level the design of the label was worked on by both breweries’ lead designers. Phineas Jones, from Half Acre worked with Marz Community Brewing’s Creative Director, Michael Freimuth, to capture the spirit of Lumpen’s Omnolithic irreverence by using inspiration from the architecture of brutalist east european monuments. By examining the shapes and geometry of those 60’s era structures the two were able to design a simple minimalist icon to adorn the label. On Friday August 12, Omnolith will be released at Half Acre Brewing’s Lincoln Brewing facility at 11 am. 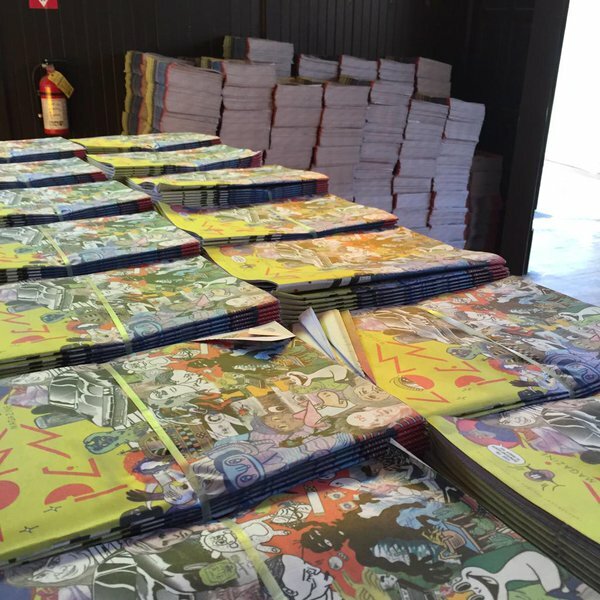 Lumpen Magazine will be giving away various back issues of the publications at the bottle release event. That night Lumpen will take over Maria’s Package Goods and Community Bar ( 960 W 31st St) for the south-side bottle release and celebration. Starting at 5pm , attendees can either get a bottle to go or enjoy a draft pour in the bar. Kimski will be creating a special to pair with the beer and More back issue of the Lumpen magazine will be given away. Why aren’t we all developers by now?